Birthdays are kind of funny. When we’re kids, we can’t wait to have them. It’s a badge of honor to be 5 and a HALF because we know that before too long we’ll turn 6! We know that when you go from 12 to 13 you enter the ‘Twilight Zone’ called the teenage years! We also know that as you get older, there is a certain mystic quality with each new level in life that has been ascertained. For example, we both have the SAME birthday. . .today as a matter of fact. . .and those of you who know us and read us–for the most part already know this–but for those who’ve been following this year. . .welcome to something cool and amazing. . .Jean and Brian have the same birthday. Yep, same day, same year–heck, they were even baptized on the same day! But, part of what has made this day so awesome over the past 30+ years has been sharing this day with others in our lives. It all started back in 1989–the dreaded 30th Birthday! The thoughts of being out of our 20’s and into our 30’s was daunting enough, but we decided to meet it head on! Yep. It was PARTY TIME! So, we created Bondy Bash–an annual display of overindulgence on food, beverage and good times. The first year was held at our rent house in St. Peters, Missouri. The house had an above ground swimming pool; a basement and a fenced yard. . .other than that, well, it was a creaky, ugly house! By the time we sent out invitations and heard back from friends, almost 60 people had told us they were planning on joining us! We fired up the grill; iced down the keg; sliced up the watermelon and were ready for a king-sized birthday bash. And it went really well until the weather moved in and forced us into the basement. Fortunately we had the keg with us and all was right with the world. Funny how that one event led to the next year and the next year and so on and so on! The birthday bashes continued after the birth of daughter #1. . .thank goodness for friends! The birthday bashes continued after the birth of daughter #2. . .that year, the rains had been so bad, the mosquitoes looked like 747s and the jello shots were plentiful! After a move to a new neighborhood, the bashes continued until 1999. . .the BIG 4-0! This was going to be the last in a long history of bashes, and with family, neighbors and friends we celebrated long into the night. It was an amazing way to celebrate-not only a birthday-but life in general. By the next year, we were looking at moving back to Texas and the bashes came to an end. Our kids had ‘grown up’ on these fun, amazing parties and for us, we’d grown to love and appreciate a bunch of terrific people who were part of our lives! In the ensuing time period from 1999 to 2009, a lot happened in our world. Jobs took us from St. Charles, Missouri to Aransas Pass, Texas to Kerrville, Texas and when it was time to celebrate our 50th. . .well, we knew that there was only one way to do it RIGHT! Yep, we brought back Bondy Bash. . .and introduced it to a whole new group of people who’d never known what it was like to party until 2 am. . .grill some bratwurst and burgers. . .sip on some really cold beer and hear the rants and raves from family and friends. In short, the party was something that our friends still talk about to this day! Birthdays. . .they help us to stop and realize how much we really have in our lives. For the both of us, we are BLESSED beyond belief and don’t think for a moment that we don’t appreciate it. So, we needed a wine tonight that was out of the ordinary. A wine that spoke of the independence that having milestone birthdays offers. 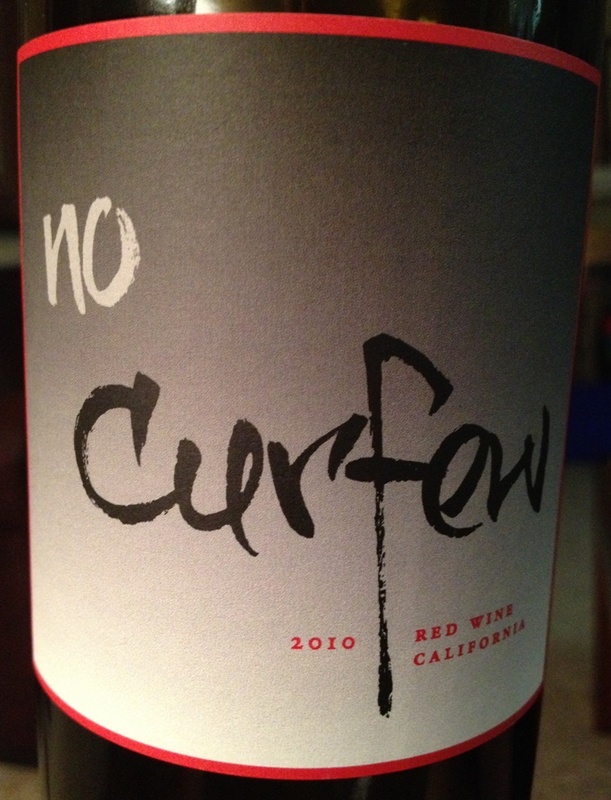 A wine that says, “I’m not beholden to anyone anymore!” Tonight we opened a 2010 No Curfew Red Table Wine from California. UH-YEAH, Curfew. Before the 18th birthday, curfews were in effect in both of our houses. To quote Mr. T, “I pity the fool. . .who misses curfew, BUT I’d like to party with those with NO CURFEW!” Okay, he didn’t really say that, but it sounded good! So, this wine is red. . .duh. . .and it’s got a lot of cranberry on the nose and on the palate. And, if you’re into cranberry, then you’re going to want this wine. If not, you may want to try Ocean Spray instead! There are hints of tobacco and leather. . .and as the wine opened up, we tasted a lot of black raspberries and currants. According to their notes, “This wine opens with aromas of violets, blackberries and hints of spice, leading to gorgeously fruited layers of blackberry, cherry and blueberry with a dash of mocha. The lush initial mouth-feel leads nicely into a mid-palate with excellent structure and balanced acidity. Dark berries dominate the finish, which is clean and long.” Hmmm, well, so much for our view versus the tasting notes! We weren’t overly excited about this wine. A cute name with LOADS of potential that fails to deliver in the end. BUT, a great wine to break out and enjoy for a special day like today. Yep, we’ve gone a lot longer than expected on this blog, but we are excited to share with you our birthday and our love of wine–good, bad and ugly–and, once again as our good friend tells us each time we’re together. . .”Life Is Too Short To Enjoy Bad Wine!” Well, enjoy your favorite wine responsibly and remember to recycle whenever possible! Categories: Uncategorized | Tags: 2010 No Curfew, Aransas Pass, Kerrville, Missouri, St. Charles, St. Peters, Texas | Permalink.